Peter Buffett believes he's received the best investing education anyone could ever hope for. After all, his father is the Oracle of Omaha, Warren Buffett, chairman of Berkshire Hathaway (BRK.A). But though he ranks No. 3 on Forbes' list of the world's richest people, the value of the elder Buffett's advice wasn't wrapped up in ways to make money and a killing on Wall Street. Rather, says his son, a 53-year-old New York musician and author, it was laced with more fundamental ideas about how a person should live their life. "He would talk to us a little bit about finances, but it was more about his general philosophy on life. He would say, 'You don't have to swing at every pitch. When you're ready to invest [in a stock], it looks like a fat, slow-moving ball.' But that's so true in many things in life. You don't have to swing at every pitch," Peter Buffett says. "The money is the goal for so many people. My dad's goal is about being right." Buffett's father is a conservative value investor, renowned for his ability to delve deep and uncover the intrinsic value of companies. And that strategy of striving to be "right" has paid off handsomely. Over the past decade, Berkshire Hathaway has consistently outperformed the broader markets by impressive margin. "He would ask some question about a product, especially from my sister who was older. He would try to determine the demographic interest in something like a newspaper. He'd ask questions like 'how often do you read it.' We knew we were being tested," the younger Buffett laughs. In 1977, when Peter Buffett was a teen, Berkshire Hathaway purchased the Buffalo Evenings News, a New York local newspaper. And despite the beating the newspaper industry has suffered over the past two decades, as circulation and advertising have declined and a shift toward online advertising has emerged, Buffett continues to hold the investment, citing his love of newspapers. Buffet's dad is definitely not one to be swayed into dumping things just because they are old or out of favor. Peter still visits his father in the same modest Omaha, Neb., family home in which he was raised, despite his father's immense wealth. "The thing that I admire most about my dad is his authenticity. Authenticity is No. 1. He is who he says he is and all that goes with having integrity and honesty," says the younger Buffett, adding with a chuckle. "His brothers names are Frank and Ernest. You can't get much better than that." Peter Buffett says the greatest gift he could give his father is to follow in his footsteps by being authentic to himself. "I think he is aware of this in me," says the younger Buffett, citing incidents in his own career as a musician. After he scored a song used in Dances with Wolves, the Oscar-winning movie directed and starred in by actor Kevin Costner, Buffett was told by a number of Hollywood agents he would have to uproot his family from Milwaukee and move to Los Angeles if he wanted to become a serious film composer. "I seriously thought about moving for a couple weeks, but then I thought, no, I don't want to move and I want to focus on something that is more real to me," recalled the younger Buffett. "I thought about my dad and how he could have moved to New York to be closer to Wall Street. But in watching my dad operate over the years, I learned you don't do things just because they looked sexier over there. This has served me well because it's taken me to different places than the norm." Warren Buffett's parenting style also included letting his kids fail and succeed on their own. In other words, he wasn't a helicopter parent, always hovering about. "His management style is the way he is in life. In a business environment, he finds great management and says 'I believe in you,' and then leaves them alone," Peter Buffett says. "I'm a big believer that experience is everything. And when you fall down and get up by yourself, you feel so much better about yourself." He added that if he believed his father would financially bail him out every time he got into trouble, it would undermine any success he encountered. 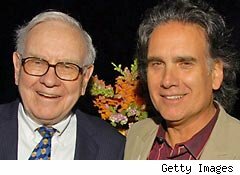 Peter Buffett's financial standing did not come from his father's wealth, nor any hot stock tips from dad. In fact, the younger Buffett has never purchased a share of stock. He received $90,000 in Berkshire Hathaway stock in 1979, purchased from proceeds from the sale of his grandfather's farm. The younger Buffett said his dad had been in a conundrum about what to do with the farm. Neither he nor his sister or brother, all young adults, were capable of running a farm. "My dad didn't believe in misallocated capital and he didn't believe in inherited wealth," says Peter Buffett. "The Berkshire Hathaway stock was my big head start and it was kicked in my head that it would be all I would get. People wrongly assume we [kids] get piles of money from our dad." Indeed. Warren Buffett in 2006 pledged $37 bilion to the The Gates Foundation, earmarking the vast majority of his wealth with the nonprofit and not his children upon his death. Says Peter Buffett: "I watched someone who transferred values to me, and not wealth."